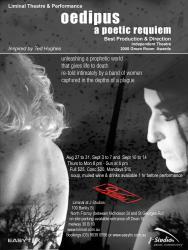 Adapted from Ted Hughes’ evocative translation, Liminal Theatre performed two versions of Oedipus - A Poetic Requiem, in 2008 and 2009. As part of the 2008 Melbourne Fringe Festival, an unassuming suburban garage was recreated as a beautiful, intimate theatre space for our first season, while in 2009 the work was performed at our new studio within the J-Studios precinct. 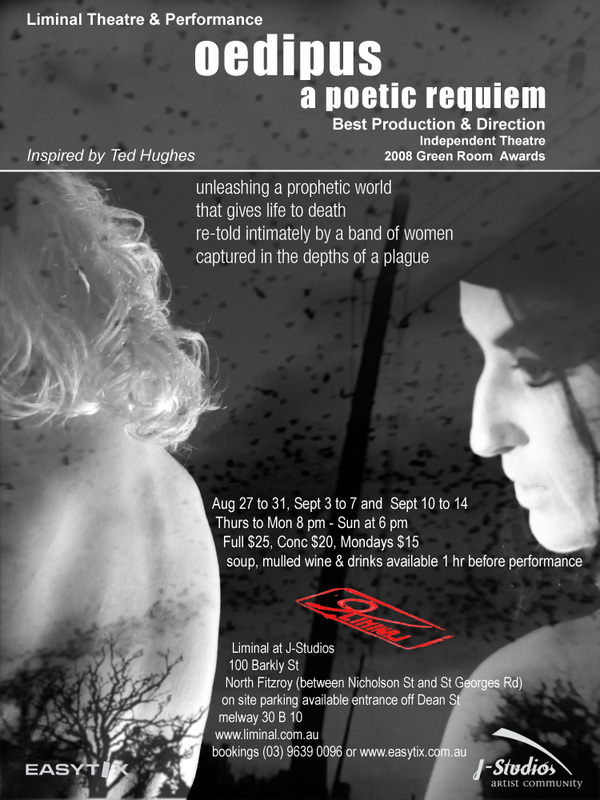 This recipient of the 2008 Green Room Awards for Best Production and Best Direction) imagines Oedipus performed by four women actors, captured in the depths of a plague, unleashing a prophetic world that gives life to death. Oedipus - A poetic requiem was directed by Mary Sitarenos and will be performed by Jo Smith, Georgie Durham, Claire Nicholls and Ivanka Sokol, with lighting by Damian ‘Mimmo’ Lentini and sound by Chris Wenn. Ivanka Sokol, recipient of the 2007 Audio Visual Green Room Award for Liminal Theatre and Performance’s production of The Damask Drum, creates the moving landscape for this evocative work.